LED Matrix Graph is a simple program to track two physical values over time. Start with two potentiometers; variations replace the potentiometers with Light-dependent Resistors (LDRs), then with capacitive sensors. 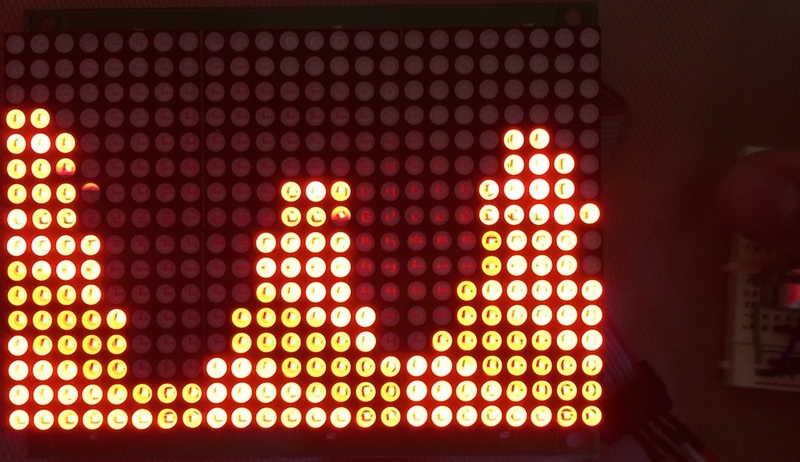 The two values are graphically represented on a 16x24 Red LED Matrix, like this one from Adafruit. Requires minimal soldering skill; moderately complex programming. 18×24 LED Matrix, like this one from Adafruit. Should include ribbon cable. 2 Linear Potentiometers, like these from Adafruit or these from Jameco. 2 Light-dependent Resistors, like this one from Jameco. Preparing the LED Matrix board may also require a soldering iron to bridge jumper J5 on the back of the board. See the Adafruit tutorial for details. Plug jumper wires into the ribbon cable and your Arduino as shown in this Adafruit tutorial, but plug the 5V (red) and GND (black) wires into your breadboard instead of directly into the Arduino. Try to match colors if you can; it will make for less (and eaiser) debugging. Download and install the HT1632 library for the LED matrix board. Note that the LDR circuits now never reach either extreme of their range. Read about the map function and see if you can resolve this issue. Download and install the capacitive sensing library. Learn more about capacitive sensing at the Arduino playground.